You know you’ve hit the jackpot when you meet months before the wedding to discuss the style of photos we were looking for and half the time is spent talking about travel, adventure and whisky. Beyond being amazing photographers, Kara and Noah are amazing people whose warmth is infectious. They put people at ease and capture moments big and small that perfectly encapsulates the day. What stood out was not JUST the incredible photography but the ease and grace in which they navigated the day. They were willing to do whatever it takes to get the shot without adding stress. The conversations were open and honest. And a testament to just how amazing they are at their job, we got all of our photos in the can AHEAD of schedule. When does that ever happen! A trip through the photo book is a trip down memory lane and these photos will be something that we and our family will forever cherish. Wow! Just wow! These photos are amazing! We love them so much and have had such a good time viewing them and reliving all of the amazing memories. Coincidentally, we were visiting family in New York last weekend... It was perfect timing to share with them and we had so much fun looking over all the photos together. So beautiful! We can't thank you enough for all of your hard work that day and in the planning process. You guys really did a great job capturing the day and not only that, your calm and joyful presence brought a sense of ease to the whole project (which was a good thing because clearly we are not used to having that much attention on us!). You really made it fun. Beyond all that I just have to say again that I LOVE your photographic eye. You really captured all the beautiful light and the natural details...which were all really important to how the event felt.... you really captured that feeling. Everything looks just like I remember it (but even better!). I love how you really documented the day... the images all look really natural, even the portraits. They are perfect! The photos are absolutely GORGEOUS! We could not be happier with the way they turned out. You did such a fantastic job and brought our vision to life! We cannot wait to start sharing with family and friends. Thank you again for everything! The attention to detail and documentary style was exactly what we wanted. I cannot wait to work together more in the future and recommend you to everyone we know! Our wedding extravaganza was perfectly captured by Kara! Kara made the entire process from planning to the wedding day to getting the pictures after, such a breeze. We absolutely loved the polaroid pictures you sent us after the wedding as we waited for our edited pictures. All the little details you made sure to capture on our special day just continues to bring us so much joy. Your pictures currently hang throughout our home and some of our families’ and friends’ homes. Everything you captured in your pictures showcased the love that Dakotah and I are surrounded with, between each other, our friends, and our family. It was such an amazing day, and we are beyond blessed to have pictures that radiate the love. We are extremely grateful to have had such a dedicated and easy to work with photographer. Your pictures allow us to envision and relive our wedding each and every day for the rest of our lives. Thank you for perfectly capturing our most special day. Thank you so, so, so much for the absolutely INCREDIBLE photos!!!!!! I could not stop crying while Jonny and I were looking at them one by one, and I'm not talking a few tears leaking out. I'm talking full-on sobbing. They are so beautiful and evoke so many insane emotions from the day, plus you captured dozens of moments that I had no idea happened. I could not have asked for more wonderful memories of the wedding in Vermont, and cannot thank you enough. We adored having both you and Noah there and appreciate your amazing eyes, acrobatic dancing, and suggestions for photos. There's not a bad one in the bunch. WOW! Thank you for the amazing photos! Kara, I absolutely love them!!! We had such an amazing time with you! Thank you for trekking around the city with us. It really meant a great deal to me to take photos around chinatown. We love the quality and the images. looking at the pictures really brought me back to the day ;) I've received so many compliments about the photos and how you captured the 'feeling' of the moment. Thank you so much!!! I hope we'll get the opportunity to shoot with you again, Kara! We filtered through a bunch of pictures from other photographers during our search and we're sooo happy and thankful we found you! We hired Kara to shoot our July 2018 wedding in Truckee and couldn't be happier with the decision. Kara is an incredible photographer with a special talent for capturing the moment. 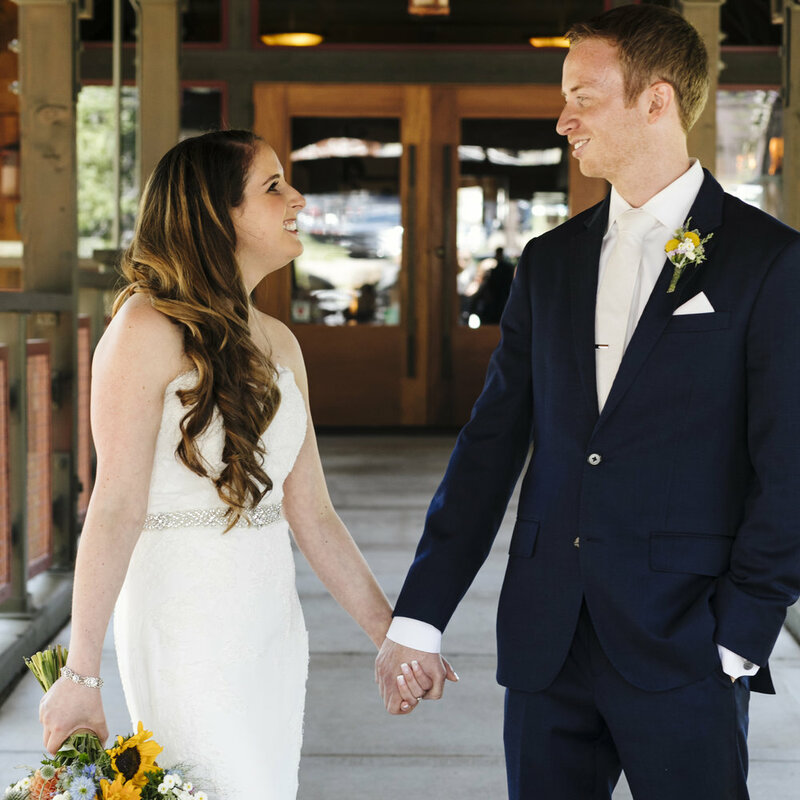 We loved the combination or candid and pre-planned photos she captured for us, and were thoroughly impressed with her ability to represent the authentic feel and energy of our big day. Kara is also an absolute professional and her thoughtfulness really came through in every interaction we had with her. She did an excellent job of working with us before the wedding to make sure that we had a solid plan for the wedding day, and that our expectations could be met. We also really appreciated her ability to keep things fun and light hearted throughout our wedding day. We would love to work with Kara again.